So far, I've built all of the tools and equipment needed to bind books (OK, I didn't make my paste brush or sewing needles). Here you'll find some of my designs and how I use all this stuff to bind books. I'm using two presses for bookbinding, a book press and a lying press. The book press is the large press you're probably imagining when you think of a bookbinding press. It's two flat surfaces, large enough to allow pressing an entire book (or books). The lying press is a smaller press that is used for various operations on the edges of the book. For the very simple binding that I'm doing (no ploughing, gilding, etc. 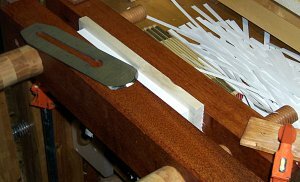 ), I use the press to hold the spine of a book together when shaping and gluing the binding, as well as to hold the support I use to punch holes in the signatures. The book press consists of two faces, each composed of two layers of birch plywood laminated together and wrapped with mitered birch trim. Four threaded rods on the corners, with wing nuts applies the force to press books between the faces. To make the press easier to operate, the nuts on the underside of the press are mortised into base supports, and the nuts are riveted onto the threaded rod. You can see the mortise and the rivet in the image on the right. The hardest part of the process is the riveting, and I broke both of my smallest drill bits drilling the holes. 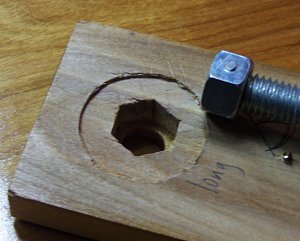 I drilled the holes through the nut and into the bolt, and then inserted a finishing nail that was about the same size as the hole, and which had it's point clipped off. I tapped the nail a few times to seat it in the hole and then clipped off the rest of the nail so that a bit of the nail was above the nut. Then hammer down the end of the nail until it's flush. Even if the rivet were to come loose (although they didn't seem to be in danger of this), the mortise in the supports will hold the rivet in place so that the nut can't turn on the threaded rod. 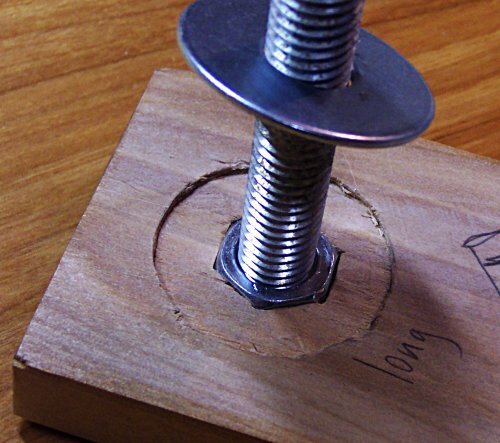 The lying press uses similar hardware and technology, but in this case, the threaded rod is fixed to the wooden handles, and the nut that's mortised into the back of the press jaw is allowed to turn. 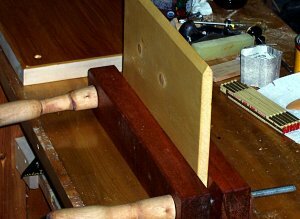 I used a piece of mahogany for the press jaws, and some alder for the handles. The handles were turned on my spring pole lathe and then I bored a slightly undersized hole through the handles. The threaded rod was "tapped" into these holes until I couldn't get the handles to turn anymore. I don't know how stable this configuration will be in the long term, but right now, the handles are very securely attached to the threaded rod. 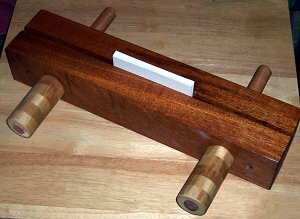 The most challenging part of the handle construction is boring a hole directly through the long axis of the wooden handles. My first attempt was pretty poor, probably 5 or 10 degrees off from perpendicular to the face. As a result, the end of the handle moves in a circle as I tighten the press, and I had to re-cut the end of the handle so it meets the front jaw of the press more squarely. It turns out this isn't really all that difficult; just tighten the press all the way, and then draw a line around the handle, keeping the body of the pencil touching the jaw. Update: I got a threadbox that cuts threads into a 1 inch hardwood dowel and adapted my lying press to use these new handles. The proper approach is to turn the handle and dowel from the same piece of wood on the lathe, and after it's dried, cut threads onto the dowel portion. 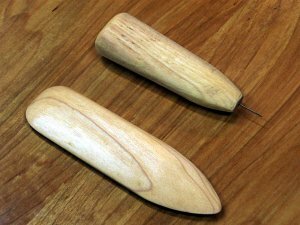 I didn't want to wait for a newly turned handle to dry, so I threaded a pair of dowels from some birch I air dried in the garage and then tapped a bunch of wooden nuts. These were slathered with glue and then screwed together on the ends of the threaded dowels. After the glue dried I sawed them octagonal and used a spokeshave to smooth them to the roughly cylindrical shape you can see in the image. You get a neat striped pattern, but the handles aren't as comfortable or smooth as something that's turned, and it's probably a lot more work than doing it the traditional way. The photo of the old lying press in the next section shows the piece of wood I use to support the singatures when I'm punching the holes used during the sewing. It's just a scrap of 1 x 12 pine with one edge planed to form a long point. In this case, the wood is 3/4" thick, and the bezel faces start 5/8" down from the corners. Both presses were finished with multiple layers of dewaxed orange shellac. A final coat of paste wax on the working surfaces should keep the adhesives from getting stuck to the press. A plough is used to trim the edges of the book so they're flush. When the sections are folded up, the pages are no longer the same size along the fore edge of the book. Sometimes these edges are left uneven (a deckle edge), but a plough allows them to be trimmed. Rather than build a full fledges plough, I decided to see how far I could get with just a plough iron. I've replaced the lower quality modern Stanley plane irons with better versions made by Ron Hock, and as a result I have a few plane irons rattling around in my drawers. So I drew a section of a circle on the back of one and ground away the excess with a grinder. After some sharpening with increasing grits of sandpaper on glass, and a final touch up at the felt wheel, I have the iron shown. To use it, you get the spine flat and the top and bottom edges squared up, and then clamp the text block so the fore edge just sticks up above the top of the press. A piece of wood or still cardboard goes behind the book so you've got something for the iron to cut against. I tried to cut using the entire edge by swinging the blade along the pages as I cut them. I cut between one and three pages per pass until I got all the way through the book. It's a little hard to see the book in the photo, but the corner of the iron is actually resting on the book I just finished cutting. There's a close-up photograph of the plough in use on my first journal project page. There are really only two other specialized tools that are necessary for bookbinding; a folder and an awl. The folder is used to make nice crisp folds in paper, as well as to scribe lines in cardboards, and an awl punches the holes in the signatures before sewing. The other implements used (needles, brushes, etc.) are store bought. Folders are traditionally made from bone, but I suspect that wood is also used, so that's what I made my folder out of. I may experiment with moose or caribou antlers to see how they might work, but for now I'll use the wooden folder shown in the photograph. It's made from soft maple, cut to the rough shape using a coping saw, and then finished with a drawknife, spokeshave, rasp, file and sandpaper. I treated the wood with boiled linseed oil. The awl is different from a normal woodworker's awl because the diameter of the shaft needs to be a lot smaller. If you use a woodworker's awl, you'll punch holes that are too large and the thread will be loose. I made my awl from a regular sewing needle, broken off at the eye, and a piece of hickory recovered from an old hammer handle. I shaped the handle using the same tools I used on the folder. To insert the needle into the end, I broke the needle below the eye using two pairs of pliers, and then carefully hammered the needle in point-end down. After it went in as far as I though was necessary (maybe an inch or so), I pulled it back out, turned it around, and forced it into the hole with pliers. Needles are very brittle, so use caution in all of these steps so the needle doesn't break off in the handle. To use the awl, I drape a signature over the sharp-edged board shown in the lying press photo, and then drive the awl through the signatures into the wood. The thickness of the needle is less than that of the #1 and #3 needles used for 18/3 and 35/3 linen thread, so the holes will be enlarged to the correct size during the sewing process. Again, you need to be careful not to break the needle.